This paper builds on our 2016 paper on communications methods for retirement saving. It explores how these communication methods could be successfully used by employers, pension providers, and Government to ensure savers adequately engage with their retirement options, drawing on examples and case studies from the UK and overseas. With increasing longevity, the rise of Defined Contribution pensions, and the introduction of Pensions and Freedoms, individuals are increasingly bearing more risk and responsibility for ensuring they have adequately saved for retirement. This shift coupled with difficult terminology, complex concepts, and an annual deluge of disclosure information can leave savers feeling overwhelmed, confused, and, as a consequence, reluctant to engage with their savings. 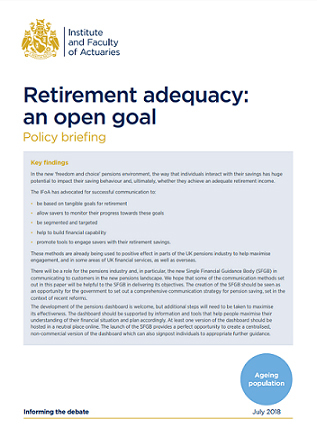 In this pensions landscape, the way employers, pensions providers, and Government communicate retirement savings will play a vital role in ensuring individuals’ are adequately and sustainably saving. More importantly, with the upcoming launch of the Single Financial Governance Body (SFGB) and pensions dashboard, the Government has an opportunity to incorporate these methods to ensure these initiatives are as successful as possible. These methods provide consumers a targeted, practical and accessible approach to retirement savings throughout the savings process. Although each stakeholder will tailor their communications to suit their specific customers’ needs, these methods provide adaptable tools, based on consumer interests and behaviours that have impact in encouraging individuals to become proactive in managing their retirement savings.